The Ultra 2 Shock Transfer Core mouthguard offers lower profile, triple layer protection with a deep, form-fitting bite for easier breathing and speaking and is designed specifically to transfer shock away from the point of impact. This mouthguard also comes fully equipped with a convertible tether. 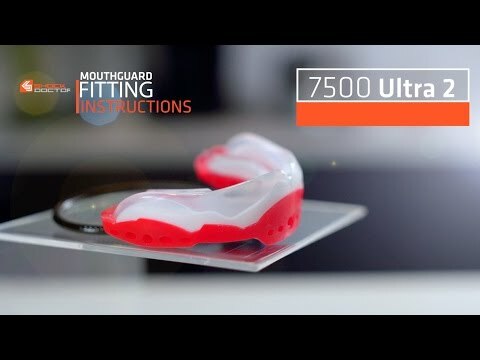 Ultra2 STC Mouthguard is rated 3.0 out of 5 by 4. Rated 1 out of 5 by Tommy from Very Bad Fit I recently bought this mouthguard for the use of this years Rugby League season, having high hopes about this particular mouthguard and its overall design. This, however, was contradicted. I found myself boiling and biting this mouthguard NINE TIMES (9), yet it still wasn't even close to moulding to my teeth, slipping out of my mouth effortlessly every single time. Correctly following the steps of the given instructions and video, none seemed to make a difference as I constantly applied the suggested techniques. Paying more money on a mouthguard than I usually would, I am thoroughly disappointed by the lack of quality of this mouthguard, and hope to purchase one that has a better fitting design in the near future. Rated 2 out of 5 by Dee Tee from Not for boxing I bought this mouth guard to use for boxing, but the front bottom portion of the guard is a hard plastic that actually caused a cut in mouth. I cut the bottom off with a razor but it became rough and I ended up throwing it away. I think it would be a great product for football or any other sport where a face mask is the first defense of protection. Although I gave it a low rating for boxing I would recommend it to a friend for other sports as indicated. Rated 4 out of 5 by Sean from Comfortable, easier to breathe. Light weight, comfortable and give you the ability to breathe. I am a professional jockey and use them for obvious bangs to the face but mainly to help prevent concussions from falls. I have worn many over the years, mainly expensive custom dental fitted gum shields and I find very little difference between this model and the custom fitted mouth guards. Con; I am constantly losing them!